Are you trying to decide if solar is the right decision for you and your family? We've compiled this list of questions as a helpful guide. Ask yourself these things, and you'll soon be making an informed solar decision. How much am I currently paying for electricity? Pull out your last month’s energy bill. Did you pay over $150 for your electricity last month? If so, you’re already a candidate for solar. Think of it this way. Instead of paying unpredictable monthly payments for energy you purchase from another company, why not pay a lower monthly payment for energy that you own yourself? Similar to owning vs renting a home, you can own your energy as well. Plus, once your system is paid off, you will have zero monthly payments. This is the best first question to ask if you’re considering solar. Is the house that you’re currently living in the one you’ll be calling home for the next 10+ years? If so, solar should be a serious consideration and will likely be a positive investment for you. You'll be saving on your energy bill from day one, and after 6-10 years most homeowners have paid off their entire investment are fulling owning their power. If you think your current home is in your long-term plan, solar energy could be a major money-saver for you. Alternatively, if you feel that your current home is a temporary solution and that your housing needs may grow or change, it may not be the best time to switch to solar. What sort of government programs or incentives could I get? The United States has created incentive programs to make it worth your while to invest in solar. 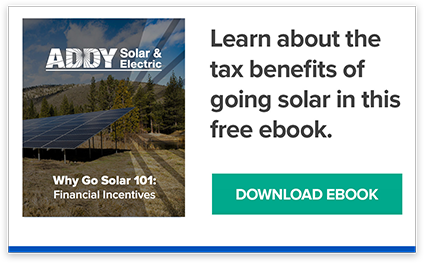 The government has proven the long-term benefits of solar energy and have created the Solar Investment Tax Credit (or ITC) which allows you to receive a 30% federal tax return on the total amount you spent on your solar system. For example, if you invest $30,000 in a solar panel system, you’ll receive about $9,000 to put towards your annual tax burden. This incentive is available for you in the first year, and your tax credit can roll over to subsequent years if you don’t use it. How long will it take for this to pay for itself? While there are a variety of factors involved, the average time it takes to pay off a solar system is 6-10 years. You’ll pay off your system in fixed monthly payments, which vary depending on your credit and loan terms. Typically, you’ll be paying less than what you're currently paying monthly for your PG&E bill. Of course, if you go with a higher down payment from the beginning, pay cash, or use a Home Equity Line of Credit, your system will pay for itself much quicker. Imagine complete independence from the electric company and zero monthly payments. That could be your reality in just a few years of investing. Get more information about solar. Solar panels are great, but what if your solar system could have a brain?